In 2007, a Virginia Tech student opened fire on campus, killing 32 of his classmates and teachers. The incident catalyzed a movement to allow gun owners with concealed-carry permits to bring their weapons with them onto college campuses — places where guns have been traditionally banned. That same year, Utah became the first state to pass a so-called campus carry law. Since then, at least nine other states have adopted laws that allow guns on university grounds. The most recent was Arkansas, which opened up college campuses — and sporting venues on college campuses — to concealed-carry holders on March 22. Under intense public pressure, the legislature scrambled to give universities a way to keep stadiums gun-free: Governor Asa Hutchinson signed the revised bill on Tuesday. Georgia could be next: a campus-carry bill is also on Governor Nathan Deal’s desk. Last year, he vetoed a slightly stronger version of the same legislation. Not all campus-carry laws are the same. Here is what we know about where they apply, what they do, and about the movement that is spreading them. Campus carry is the broad term for laws that allow for faculty, staff, students, and individuals other than security or law enforcement to bring firearms onto public school property. The states with laws on the books that mandate public universities to allow guns on campus, according to the National Conference of State Legislatures, are Arkansas, Colorado, Idaho, Kansas, Mississippi, Oregon, Tennessee, Texas, Utah, and Wisconsin. Minnesota has a narrow version of campus carry that allows visitors to carry guns, but not students or faculty. Another 23 states leave the decision of whether or not to allow firearms on campus up to individual universities, and 17 have outright bans, according to NCSL. I feel like I’ve only started to hear about campus carry recently. Is it new? The effort to allow concealed guns on college campuses began a decade ago, but has gathered momentum in the last two years. The measure, which now heads to the governor’s desk, follows a firestorm of public criticism over the state’s original legislation. Okay, back to the campus: Do these laws mean that students can carry guns anywhere? Like in classrooms and in dorms? It depends. Some states require schools to allow concealed weapons almost everywhere. However, in some states, schools can prohibit firearms from certain areas. In five campus-carry states, firearms are not allowed in classrooms. The exceptions are Texas, Colorado, Utah, Idaho, and Arkansas. Most states prohibit firearms in campus living quarters — with the exception of Utah. But, starting next school year, Arkansas will become the second state with firearm-friendly dormitories. In Colorado firearms are banned from all undergraduate dorms. But if a student requests, he or she can be transferred to graduate housing that allows firearms. In Kansas, a law will go into effect in July requiring that any university building where firearms are prohibited have “adequate security measures,” including metal detectors and onsite firearm storage. Universities had four years to comply, which they must do if they wish to keep guns out of classrooms and dorms. Private colleges and universities are given the opportunity to opt out of campus-carry laws. In response to the Texas law, which went into effect last year, all but one private university opted out. This fact was lost amid the hoopla over the Arkansas law that briefly opened up all college sporting venues to concealed weapons. It’s not the only state to have done so. Utah has allowed firearms inside college stadiums for a decade, with a few exceptions. In 2015, the University of Utah prohibited guns at U.S. Supreme Court Justice Sonia Sotomayor’s book tour stop at the school’s flagship arena in Salt Lake City, citing a security threat to the justice. Do people who carry guns on campus need to have training? However, starting this summer, Kansas will pave new ground on this front. The state did away with permits two years ago, and an exemption will lapse this summer that allowed public universities extra time to comply with a law allowing concealed weapons in all public buildings. So, as of July 1, anyone over 21 can carry a concealed weapon to school — no permit or training required. What happens when schools don’t want to comply with campus-carry policies? They can encourage state lawmakers to revise the laws, or take them to court. Three professors at the University of Texas, Austin, tried the legal route late last year. They argued that the presence of firearms stifled free discourse at the university. The lawsuit was eventually dismissed. What do students, administrators, and the public think about campus carry? Students and university administrators have been some of the most vocal opponents to campus-carry policies. More than 400 college and university administrations have joined the national Campaign to Keep Guns Off Campus. And in Texas and Georgia — two of the most high-profile campus carry fights in recent years — student protests consumed colleges as bills advanced through the legislature. The same goes for the general public. In Florida, where lawmakers have considered campus carry for several sessions, a March poll found that more than 60 percent of registered voters oppose guns on campus. The International Association of Campus Law Enforcement Administrators has changed its stance on campus carry over the years. 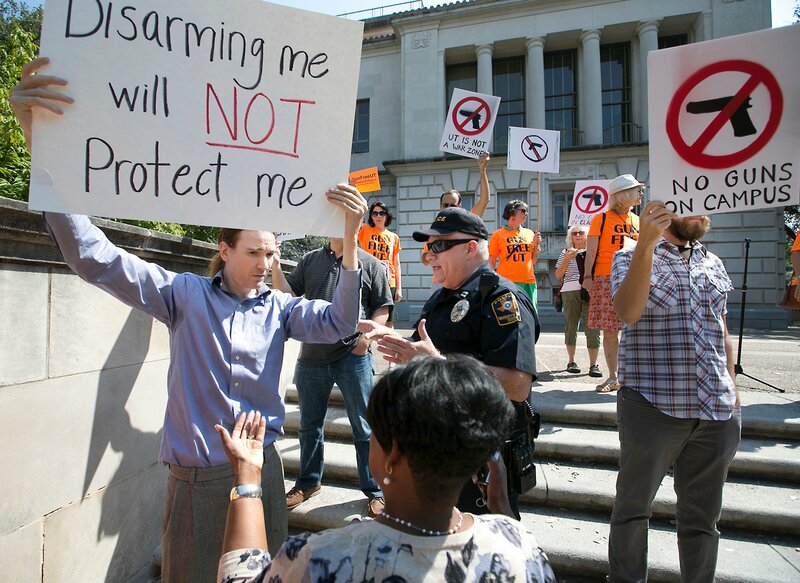 In 2008, the association issued a vigorous opposition to guns on campus, citing the concern that officers wouldn’t be able to distinguish between bystanders and assailants in an active-shooting situation. Yet in March, the group’s president told reporters that the organization could no longer come to a consensus on the issue. 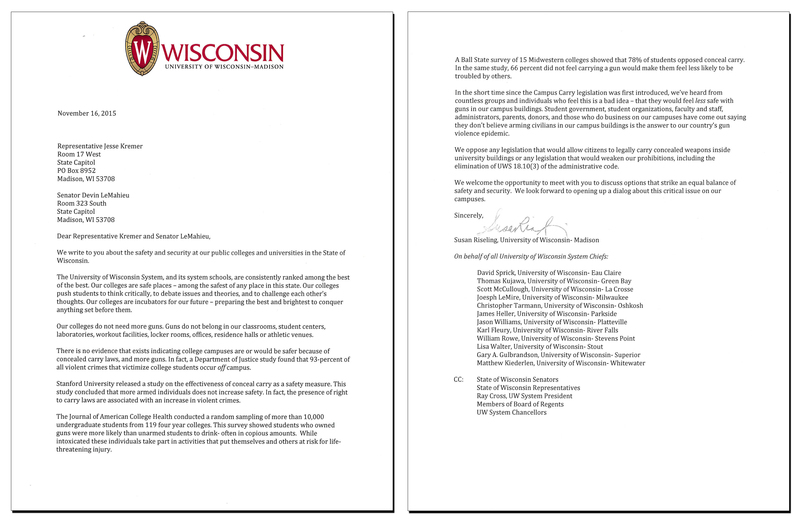 In 2015, the chiefs of police at 13 University of Wisconsin campuses published an open letter voicing their opposition to the state’s campus carry law. “Our colleges do not need more guns. Guns do not belong in our classrooms, student centers, laboratories, workout facilities, locker rooms, offices, residence halls or athletic venues,” the letter read. Who are the proponents of campus carry? The most active lobbyists for these bills are The National Rifle Association and a network of pro-gun student organizations, Students for Campus Carry. The Trace’s reporting revealed that SCC members, over 40,000 strong, are trained by veteran right-wing operatives. The argument advanced by these groups is simple: The more guns on campus, the more opportunities to stop a mass shooting. Do guns on campus make students safer? There’s scant evidence that a “good guy with a gun” — a standard gun rights talking point — can protect against an attack. Of 160 active-shooting incidents between 2000–2013, detailed by an FBI report, the assailant was stopped by a concealed-carry permit holder in only one case — and he was a Marine. On the other hand, 21 active shooters were stopped by unarmed citizens. Correction: An earlier version of this article misstated the number of states that allow guns in classrooms. It also mischaracterized a quote from the Austin chief of police. The quote was in reference to the state’s law to allow carrying a gun without a permit, not on college campuses.